No more mockingbirds to kill. That takes our breath away? Constantine Cavafy's Ars Poetica was first discovered and "deciphered" by Michael Perides and appeared in K. P. Kavafes: Anekdota peza keimena (C.P. Cavafy: Unpublished Prose Pieces), published by G. Fexis in Athens in 1963, on the hundredth anniversary of the poet's birth. I first became aware of this "poetics" of Cavafy through a subscription to the remarkable magazine known as The Charioteer: A Review of Modern Greek Culture, which began publishing in the early 60s and which, I think, continued up into the late 80s--an unassuming, beautiful little magazine of seminal importance to those readers who wanted to learn more about Modern Greek culture than what was then available to them--zilch. From the Introduction to The "Poetics" of Cavafy, by A. Decavalles: "Mr. Perides was going through the poet's archives and came upon fifteen manuscript pages of varying length and age, written partly in ink, partly in pencil, with corrections, emendations, additions and deletions. All indicated that the text was meant for publication if the poet ever went back to give it its final form. He never did. . . The text was in English, a language which the poet was familiar enough from the days of his childhood so as to speak it fluently at home, with his brothers and friends, and even to use it extensively in his essays, notes, private diary and much of his correspondence. He, however, never wrote his verse in it. 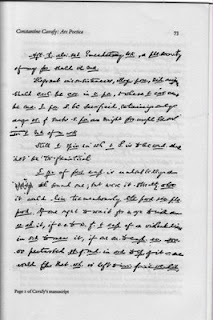 . . .It was Mr. Perides who gave the untitled text its quite justified title. 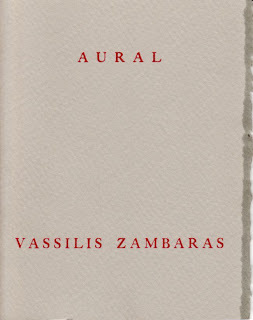 The few pages we are in possession of give us a most revealing insight into the theoretical background, the poetics that stood behind and shaped Cavafy's poetry as we know it, its relationship to life and experience, its artistic and philosophical objectives. We regret only the fact that this essay was unfinished." 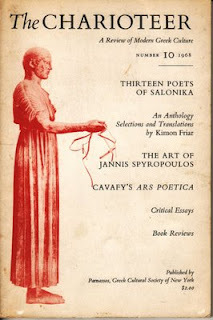 Here is the link for those curious enough to read what Cavafy had to say about the Art of Poetry. 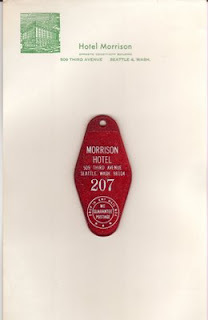 Some souvenirs from my stint as the lone night desk clerk (11 pm-7 am) at The Morrison Hotel, October-May 1974-75, Skid Row, Seattle, Washington before the city was overrun by Microsoft et al., transforming what was once one of the most laid-back cities in the USA into a frenzied condo haven for yuppies and caffeine junkies hooked on Starbucks. Room 207 was the room reserved for the desk clerk--after eight hours working the night shift and dealing with what was considered the city's most difficult clientele, it was my haven when I was too tired to take the bus to a house I shared with four other people in the Madrona District. 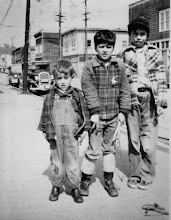 Incidentally, most of the poems which later found their way into my first book Sentences were started and finished during this hectic period of my life. A poem in twenty-four parts, first published in an edition of 190 copies by Gil Ott's Singing Horse Press, 1984.
the wind cut us in two. a laying down of arms, warmth. bared limbs his dreams picked clean. I sweat out his tip.